I got a bunch of cute kitchen linens from one seller for £3! I just looove these aprons, so kitsch! 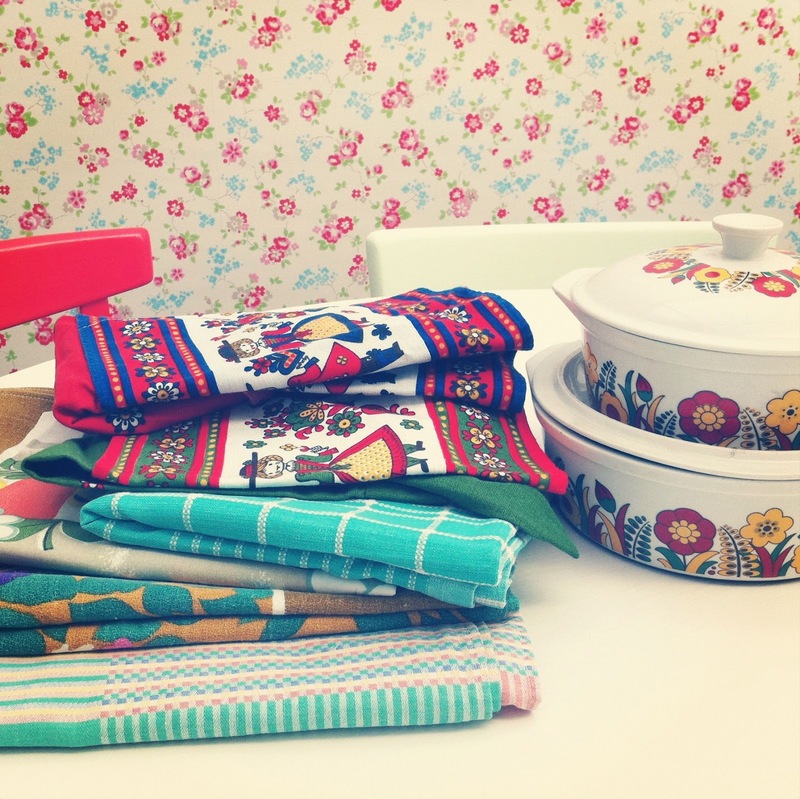 and I already have a tablecloth I found a while back to match the red apron, perfect :D The tablecloths are really lovely too, I'm such a hoarder of these - and I just fell for those sweet little casserole dishes straight away, couldn't say no. Oh wow! Fun goods. I always feel so lucky when I find goodies like these! Gorgeous! Love that apron :) also very jealous of your dishes! You have a gift for vintage finds! Great haul. Lucky you, wonderful finds. The colours remind me of painted house boats! I am guilty of hoarding vintage table cloths, too. I love them! Ok, this inquiring American wants to know - what is a car boot sale? Cars in a parking lot with the boot open and things for sale? :) Tee hee. I am just trying to picture what that could be. You've found lovely things! Here in Madrid, it's not very common buy things by that way (maybe, but I have never heard it). You're lucky!